"If you haven't been to JJ's Cantina then you haven't been to Rocky Point." 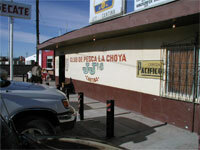 JJ's Cantina, the most famous party place for fun and sun lovers in the U.S. and Mexico. It also has a reputation for getting pretty wild, with fiestas until the wee hours of the morning! For over 20 years this world renowned landmark has been the gathering place for beach lovers everywhere. Fishing Derby, OTL Softball, One Club Open Golf, Bathtub Races, Whiplash Races and Sail Boat Races are all part of the many activities that bring people here to Cholla Bay and JJ's Cantina! Also known as the fastest growing area for family owned property and fun, JJ's Cantina is noted as the place to be for family events, fish tacos and hanging out with old and new friends. Being on the Bay, at the Sea of Cortez is relaxing and invigorating. Put away your worries and enjoy the relaxation of watching the fishermen come right up to our back door or catch the Sunsets across the bay. Take a fishing trip or get the fresh catch of the day on our patio steps. It's all up to you! The future of JJ's Cantina is uncertain since it is currently for sale.